We live in a world of decisions, good and bad, with noble impulses and poor ones. We are prey to temptation and even to sin. We rationalize and justify our conduct and grow confused. God gives grace in answer to prayer. In His humanity Christ pleads for us at the right hand of the Father. His mother prays for us. This is a place to ask for her prayers, seeking the grace we need but also seeking the grace others need. This statue shows Our Lady and her Son. It shows too, a lily representing purity and a dove representing peace. The message is that through attaining purity we may find peace with God and each other. In 2009 The Bishop of Northampton, the Rt. Rev. Peter Doyle, allowed us to invoke Our Lady of Missenden in this place where there was a shrine in medieval times. You are recommended to say three Hail Marys for your intention. If your prayer is answered, please let the Parish Priest know. The statue was blessed by Archbishop Dr. Stres of Ljubljiana, Slovenia on 29th October 2010 after a special Mass of Reparation for the Slovene victims of the post-war massacres of the summer of 1945. 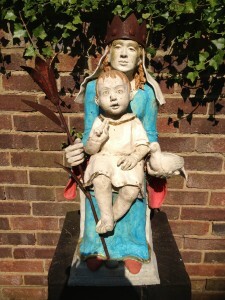 Our Lady of Missenden: Pray for us! St Anne: Pray for us! Kip je spomenik do svetisca Nase Gospe iz Missenden in Nadskof dr Stres ga je blagoslovil 29. Oktobra 2010, ko je prisel na posebna maso k Slovenskih zrtev pokolov po vojni poleti 1945.